← working with your ideas! Sometimes the journey from an idea for design, and its creation and development is a quick and easy journey, but there are some designs which develop slowly over a period of time. I have designs which I open up and work on intermittently over the months, even years! My Celtic angel is one of those designs. She should have winged her way to your machines last Christmas but failed to do so. Why you ask? Probably because I want these “difficult” designs, like my fuchsia and orchid collections, to be very special and unique, and perfect! As of last year she was flat and I was attempting my first large free standing lace design. The results were not good, as I have yet to master free standing lace so it holds together but is still light! So she hung in two sections on my development board waiting to be perfected for another Christmas. During a recent visit from a machine embroidery friend I was asked about her state and why she did not attempt to fly with a tulle backing. Now why did I not think of that before! You will be delighted to know that I have spent more time with my angel recently and she is learning to fly. I am adding applique options and have improved the design a little and am currently working on making a dimensional version for hanging on the top of the Christmas tree! 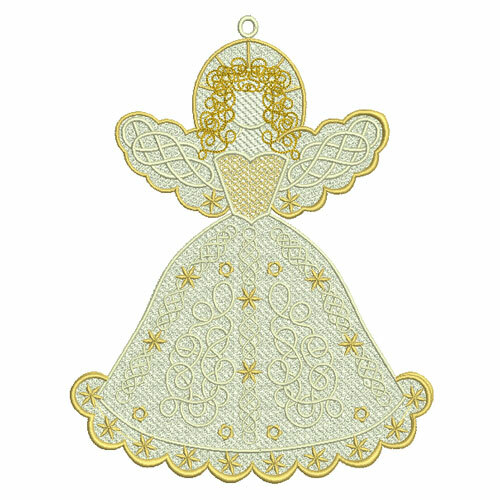 She stitches out in sections, and the upper one makes a lovely decoration for your tree too. I can see several of these gracing its branches this year. 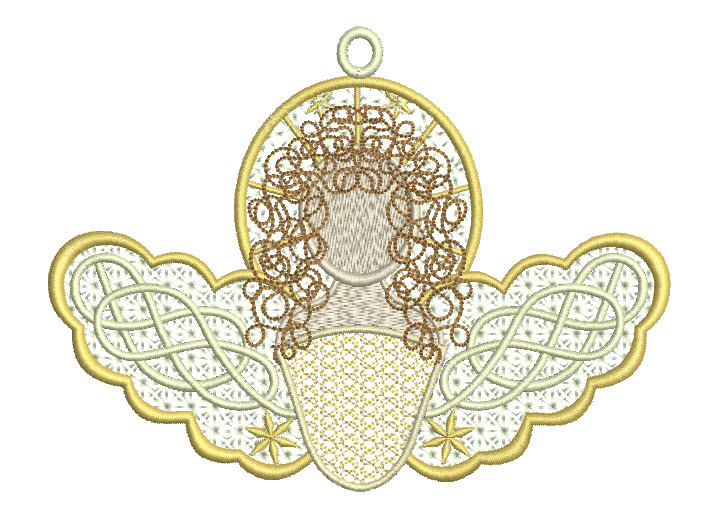 After a year of developing crazy quilt blocks and discovering the joy of embellishment, I am thinking of all sorts of options for my Celtic angel- adding lace, Angelina, crystals and beads. I will do my best to get her to you before Christmas. You will be able to pre order her very soon I am sure. I am also planning to complete my fuchsia and orchid collections too in 2016. This entry was posted in Discussing machine embroidery, New Designs. Bookmark the permalink. Hazel, your angel is absolutely beautiful! Hazel, this is beautiful! I can’t wait to order her and stitch it for my tree. But Hazel the two different angels you have pictured are beautiful. Don’t second guess yourself you always do wonderful designs for those of us who ware machine embroidery people. She’s beautiful! My granddaughter has already named ours Julia after my Irish grandmother. Can’t wait to stitch the lovely spirit out! Oh my goodness! She is beautiful and so delicate. I can’t wait until she is available. Thank you for your encouraging comments. Hopefully I will be able to share more about my “angel” very soon. She is very beautiful and I can’t wait for her wings to be released. Lovely——-some things are worth the wait! As a graphic designer/business owner, I can certainly respect your story of development and testing of your angel. I think it is unfathonable to comprehend how complicated the digitizing process it without seeing it in application. When clients bring me a grainy picture (jpg) file and say ,”I want this design on 25 shirts in 4 days, Okay?” I don’t think they understand they are asking the equivalent to build me this small barn from scratch, by yourself overnight with only manual tools! 😊 I will do everything I can to meet their needs, sometimes it’s harder than others. Especially when that nasty OCD kicks in! Your angel is lovely and incredibly beautiful. Even with 16+years of digitizing experience just the thought of designing it, makes me dizzy!! Congrats on a wonderful design & a really nice website as well.